Download free PDF copy of book. Topics covered in the book listed below. Is It Okay to Pay Full-Price? Which States Should You Target or Avoid? What Does Your Real Estate Broker Do? Whom Does Your Broker Represent? Is an Environmental Problem a Deal Breaker? Are You Sitting on Cash? Who Owns the Properties for Sale? Does Your Property Need to Be Close to Where You Live? May You Call Me Five Times a Day? When and How Do You Receive Rent? Should You Visit the Property? Should You 1031 or Pay the Taxes? How Should You Take Title? The two happiest days of owning a NNN property are the day you purchase your property and the day your tenant’s lease expires. Here’s why: When you purchase a NNN property with a creditworthy tenant, it is extremely likely that your tenant will fulfill its obligations throughout the primary lease term. This means you will receive a rent check, every month, for 10-25 years. In addition, tenants often extend their lease throughout the option periods. This means you could receive uninterrupted cash flow for 30, 40, 50 or more years. 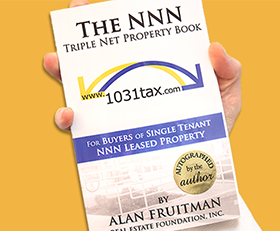 The second happiest day of NNN property ownership is the day the final option period of your tenant’s lease expires. Here’s why: Your property gets a “second lease on life” when the tenant’s lease expires. This means you can negotiate a brand new lease with your current tenant or you can rent your property to an entirely new tenant. Either way, the new lease will be at the new market rental rate. Think back 20 or 30 years. Rents were very low relative to today. Now imagine how high rents might be 20 or 30 years in the future. Again, the two happiest days of owning a NNN property are the day you purchase your property and the day your tenant’s lease expires.